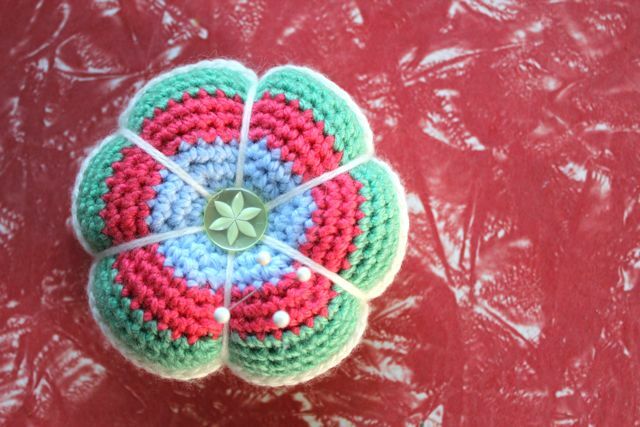 So I was looking around blogdom, and came across these gorgeous pincushions here, and after a few little linkys found a great pattern here, and of course, I had to make one of my own straight away!! Yes, there will definitely be more of theses appearing around here. On another note, would you look at the size of this egg that one of my poor girls squeezed out today! 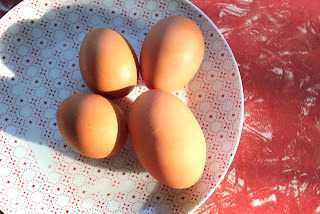 The other eggs are all pretty big too, so you can see the difference! Wonder if it's a one off, or going to become the new standard, haha! It must be all the free ranging they do through the vegie patch, they do take all the choice pickings. Playing along with the others at Our Creative Spaces today. PS Thank you so much for entering my little give away, and for all the lovely comments I have received about my cushion, you are all ace!! Think I might pop one of these little pin cushions in with it! There is still heaps of time if you want to join in, just go here to check it out! I adore these wee pin cushions - thank you so much for sharing the pattern link! Can't wait to make one. Boy oh boy, that egg! It made me wince thinking of your poor chicken trying to get that one out!! Have a fab week. That is such a lovely pincushion! !And that egg! !Its really huge! It looks great... and it'd make great Xmas pressies too! Gorgeous pincushion. I might just have a go at making one of those. Ouch, the size of that egg. We had one that weighed 102g, it was massive. I wonder if it's a double yolker. oh thats a cute idea! I never cricheted some, just sewed some..thanks for this inspiration!yours is beautiful! Congratulations on the egg supply, we are waiting for ours to start, I was told anytime,3 weeks ago. We have 1 very domanent Rooster, another rooster and 3 Hens. Then the next lot is 34 babys, not forgetting our 4 ducks. All have been incubated and raised by us. The big egg is proberly a doubly yolker, let us know as I could be wrong. awwwwww your pincushion is so cute!! I love how you have used wool to make it into a little flower!! Beautiful!! Something for you in my blog!! I love the pin cushion! The colors and the result is just great!!! I love this! So adorable. And I agree - great colors! I'm loving the pin cushionm it's so cute :) Ouchy about that egg though, poor thing! I wonder if that chook had a couple of days worth of egg laying inside her when she popped out that big one? Your pincushion is fabulous! Lovin' that pincushion, checked out the links and they look fab. Must get me some crochet cottony stuff and have a go. 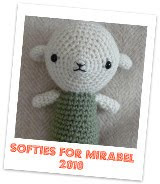 Very, very sweet and amazingly done for someone new to hooking! I can see them in christmas colours... :) All I can say about that egg is - ouch! 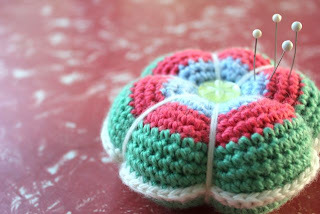 Lovely pin cushion! And that is one big egg!! Won't these pincushions make for lovely gifties for our yarnie friends. 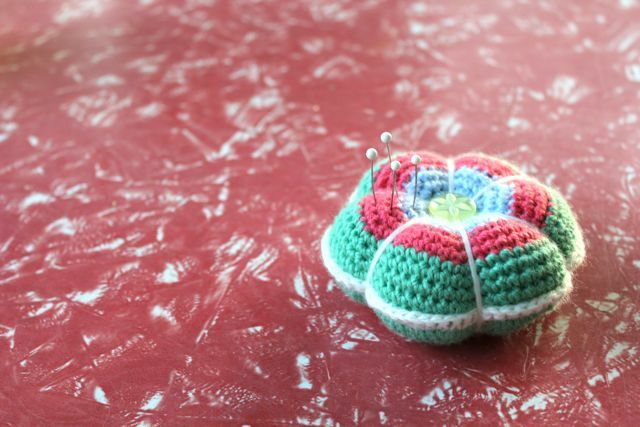 Such a cute pin cushion! Found you through Attic 24. We used to keep hens and we'd call that egg a squawker! Aren't those pin cushions just so fun to make? 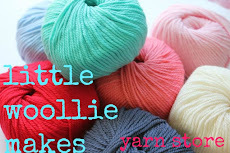 I love to use up my scrap cotton yarn making them. Thanks for linking to my pattern post! That is one cute little pin-cushion, only wish i'd seen it earlier but hopefully i can get one or two made before Xmas, thanks. These are gorgeous! I am new to the world of the crochet but am loving it. 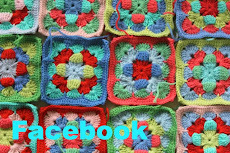 I'm working on a granny square scarf at the moment. Bring on colder months when I'll be able to wear it. Such a cute pin cushion!the button is perfect! thanks for the link,I will continue noticing your blog!